Elliptical Workouts: These machines were designed to minimize stress on the joints while providing an excellent cardiovascular workout. The elliptical machine can also give you a good upper body and lower body workout if you maintain an upright posture with your core engaged while actively pulling and pushing on the levers with your hands. Stair Climbing: Climbing stairs for 20-30 minutes is a great way to challenge your cardiovascular system while sculpting the major muscles of your lower body without excessively stressing your knees and ankles. You can use the stair machine available in most gyms or use real stairs. Either way, your heart will benefit. Cycling: Many people who were joggers in their early years switch over to cycling which provides almost similar cardiovascular benefits while being much less stressful on your joints. Rowing: It is a non-impact activity that can provide a very intense cardiovascular workout by engaging all the major muscles of the body which include the legs, back, shoulders, and arms. Swimming: Doing laps in the pool is a great way to improve your lung capacity, shoulder range of motion, and cardiovascular conditioning. Being in the water is also a great way to isolate yourself from distracting noise and focus on what really counts. 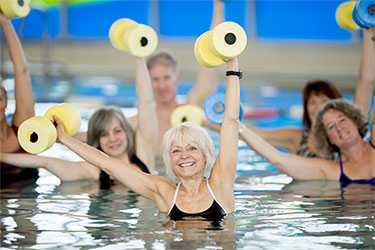 Water Aerobics: If doing laps in the pool becomes monotonous, you can mix things up by performing water aerobics. Moving in water takes the pressure off your joints while improving your balance and core muscles. Brisk Walking: The benefits of a brisk walk should never be underestimated. When done regularly, it can produce significant weight loss and improvement in cardiovascular health. Walking up a slight incline or using a pair of light dumb bells in each hand is a great way to get your heart rate up. Plus, it’s a great way to relieve the stresses of a hard day at the office. The key to deriving significant cardiovascular benefit while performing low-impact, non-weight-bearing exercises is to not be distracted by your I-phone on anything else. Stick to your workout plan. If you find your mind wandering, put more effort into it while maintain perfect form. By training smart and protecting your joints, you will be rewarded with joints that support and protect you in the years to come.